The Final Countdown: Tribulation Rising Vol.1 The Jewish People & the Antichrist gives you a multitude of prophetic signs concerning the Jewish People and their unfortunate ties with the Antichrist that will occur in the Last Days showing us just how close the Return of Jesus Christ truly is. Such amazing prophetic signs include: The Jewish People & their Eternal Covenants, Past Prophecies, Return to the Land, Rebirth as a Nation, Recapture of Jerusalem, Currency & Language, Renewal of the Land, Being a Light unto the World, Military Exploits, Conflict in the World, Amazing Resources, Rebuilt Temple, Spiritual State, and Global Anti-Semitism. Like it or not, we are headed for The Final Countdown and signs of the 7-year Tribulation are Rising all around us! It’s time to wake up! Time is running out! 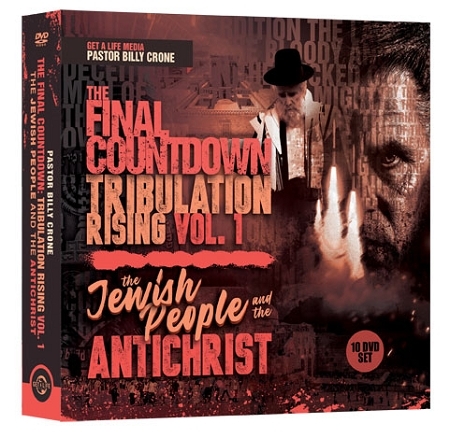 The Final Countdown: Tribulation Rising Vol.1 The Jewish People & the Antichrist is one DVD set you need to get today and watch it now! Why? Because tomorrow may be too late!